Responding to the growing regional destroyer fleets, Korea, India and Australia are rapidly expanding their own major surface combatant fleets, with increasing focus on destroyers as key platforms. As with their larger compatriots like the US, Japan, China and Russia, regional powers like Korea, India and Australia are turning to highly capable destroyers to form the backbone of their individual navies. However, the unique operating environments, evolving geo-political competitions and power paradigms and financial realities are serving to shape the size, capability and role the destroyers of these regional powers will serve in. Despite these challenges, the same broader tactical and strategic realities, including the advent of increasingly powerful combat systems and advanced weapons systems including ship-mounted lasers, are driving the role evolution of destroyers to include things like ballistic missile defence (BMD), while enhancing the already formidable capabilities of these key platforms. In the second and final part of this series, we will identify the various destroyer capabilities of key regional navies in Korea, India and finally, Australia. Republic of Korea - Navy: Korea's destroyer fleet is defined by two unavoidable strategic realities: the prevalence of both Chinese and North Korean ballistic missiles and naval forces. In response, South Korea has embarked on a program of modernisation and development resulting in a highly-capable, modern and formidable fleet of guided missile destroyers. Sejong the Great (KDX-III) Class: Designed as the apex of Korea's growing destroyer fleet, the six KDX-III destroyers will form the basis of Korea's blue-water naval ambitions in the coming decades. Weighing in at 11,000 tonnes fully loaded, with a top speed in excess of 30 knots, these vessels, like their American, Japanese and Australian counterparts, leverage the power of the SPY radar and supporting Aegis combat system. Armed with a single five-inch naval gun, a 128 cell vertical launch system (VLS) capable of supporting SM-2 surface-to-air/anti-ship missiles, locally developed Hyunmoo III land attack cruise missiles, a single Goalkeeper 30mm close-in-weapons system, a single Rolling Airframe Missile (RAM) surface-to-air missile system, SSM-700K Haeseong anti-ship missiles, anti-submarine rockets, torpedoes and hangar for two Super Lynx or SH-60 Seahawk anti-submarine helicopters. Chungmugong Yi Sun-sin (KDX-II) Class: Korea's second foray into developing a formidable locally designed destroyer, the six KDX-II destroyers were designed to perform area anti-air defence, anti-submarine warfare and anti-surface operations. Weighing in at 5,520 tonnes fully loaded, with a top speed of 29 knots, the vessels are powered by the powerful Raytheon AN/SPS-49 (V) 2D long-range radar and supporting Thales radars and BAE Systems combat systems. Armed with a single five-inch naval gun, a 64 cell VLS system, supporting SM-2 surface-to-air/anti-ship missiles, SSM-700K Haeseong anti-ship missiles, locally developed Hyunmoo III land attack cruise missiles, a single Goalkeeper 30mm close-in-weapons system, a single RAM surface-to-air missile system and anti-submarine rockets, torpedoes and hangar for two Super Lynx anti-submarine helicopters. Gwanggaeto the Great (KDX-I) Class: Korea's first attempt to develop a local design for a destroyer, the three KDX-I weigh in at between 3,885 and 3,900 tonnes fully loaded with a top speed of 30 knots, were designed to provide the Korean Navy with the basis for blue-water capability. Powered by the same Raytheon AN/SPS-49 (V) 2D long-range radar, supported by Korean and European combat systems, the vessels are armed with a five-inch naval gun, Sea Sparrow anti-aircraft/missile system, Harpoon missiles, two Goalkeeper 30mm close-in-weapons systems, 324mm torpedoes and two Super Lynx anti-submarine helicopters. Korea's strategic environment, particularly the continuing threat posed by North Korea, combined with the growing potency of China's surface fleet and, finally, the long-term, blue water naval ambitions of the Korean government, has seen the Korean Navy also broaden the design and capabilities of the nation's destroyer fleet with the planned introduction of six evolved KDX-IIA Aegis powered destroyers. It is anticipated that these six destroyers will enhance both the littoral and blue-water capabilities of the Korean Navy in response to these continuing threats, while also providing valuable coalition and assets for allied operations throughout the region. Indian Navy: India's location at the centre of the Indian Ocean and a hub for strategic sea-lines-of-communication (SLOC) require the emerging superpower to have a highly capable, modern and robust surface fleet. Destroyers are forming the backbone of the growing Indian Navy and will be responsible not only for protecting future aircraft carriers, but also guaranteeing security for India's interests throughout the region. Kolkata Class: Designed as a class of stealth destroyers, the Kolkata Class weigh in at 7,400 tonnes fully loaded, and a top speed of 30 knots provides the vessels with improved sea-faring and response times for India's vast maritime boundaries and interests. The vessels are powered by the Israeli MF STAR AESA radar and armed with a 76mm naval gun, 16 cell VLS systems supporting the Indian/Israeli designed Barak 8 air-defence missile and Indian/Russian designed BrahMos supersonic cruise missiles, four AK-630 close-in-weapons systems, 533mm torpedoes and two anti-submarine rocket launchers supporting two anti-submarine helicopters. Delhi Class: India's first domestically designed destroyers (with technical support provided by the then Soviet Union), the Delhi Class weigh in at 6,200 tonnes fully loaded with a top speed of 32 knots and are supported by a suite of joint Russian and Indian combat systems for air-defence, anti-surface and anti-submarine warfare roles. The three vessels are armed with a single 100mm AK-100 naval gun, Russian Kh-35E surface-to-surface missiles and Shtil surface-to-air missiles, Israeli Barak 1 air-defence missiles, two 30mm AK-630 close-in-weapons systems and 533mm torpedoes, depth charges and space for two anti-submarine warfare helicopters. Rajput Class: The Indian variant of the Soviet Kashin Class destroyers, designed for aircraft carrier task-force defence against submarines, low-flying aircraft and cruise missiles. The vessels weigh 4,974 tonnes fully loaded with an impressive top speed of 35 knots and are supported by a suite of Russian and European anti-air and anti-submarine combat systems. Armed with a single 76.2mm naval gun, a complex suite of Russian anti-air, anti-ship and anti-submarine missiles and rockets, Indian developed ballistic missiles, Indian/Russian BrahMos cruise missiles, 533mm torpedoes, close-in-weapons systems and one anti-submarine warfare helicopter. The growing complexity of regional destroyers, particularly by India's traditional adversary in China, has resulted in India continuing research and development for ever more capable destroyer designs, with the nation currently building four Visakhapatnam Class stealth, guided missile destroyers, which will serve as evolved variants of the Kolkata vessels. The ships will serve as the core of India's future carrier battle groups and support maritime patrol, dominance and interdiction roles. Royal Australian Navy: As part of the Australian government's plan for a sustainable sovereign shipbuilding industry, Australia's major surface combatant fleet is currently undergoing a major overhaul, with the delivery of three Hobart Class guided missile destroyers and the recent announcement of the Hunter Class vessels, which while described as frigates, are comparable in size, capability and role to traditional destroyers. Hobart Class: Australia's dedicated destroyers are based on the Navantia F-100 Class and weigh in at 7,000 tonnes, with a top speed of over 28 knots. The three vessels' powerful combat system is centred around the SPY radar and Aegis combat system supporting Australian elements. Armed with a single five-inch naval gun and a 48 cell VLS capable of launching SM-2 and Evolved Sea Sparrow missiles, the vessels are also armed with Harpoon anti-ship missiles, heavyweight torpedoes, a single Phalanx close-in-weapons system and two Bushmaster mounts, with accommodation for a single MH-60R Seahawk anti-submarine warfare helicopter. Hunter Class: Although designated as frigates, the vessels based on the BAE Systems Type 26 Global Combat Ship, weigh in at 8,800 tonnes and have a top speed in excess of 27 knots. 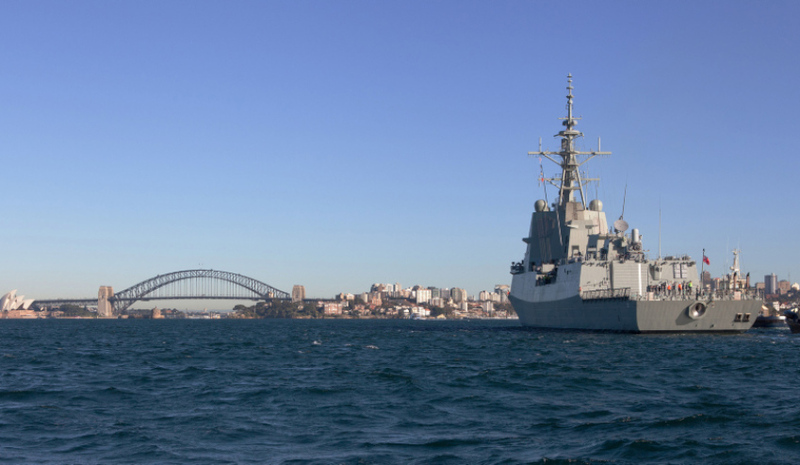 Supporting a powerful Aegis combat system, Australian developed CEAFAR 2 radar and Saab tactical interface, the vessels will be potent anti-air, anti-surface and anti-submarine warships. Armed with a single five-inch naval gun, a 48 cell VLS system and 24 strike-length VLS system capable of launching SM-2 and Evolved Sea Sparrow missiles, the vessels will also be armed with two Phalanx close-in-weapons systems and two 30mm short-range gun mounts and torpedoes, and a single MH-60R Seahawk anti-submarine warfare helicopter.